Here is one of my favorite soups. This is my mother-in-law's recipe and it is so easy and yummy. I like it because it uses baked potatoes so you don't have to peel them, plus it always thickens up really well. It makes about 4 servings, so you may want to double it. Melt butter in medium saucepan. Add onion and sauté until tender. Stir in flour, and then add broth and milk. Scoop pulp from one potato and mash; add to soup. Bring to boil and then add the rest of the potatoes (scoop the pulp and cut into cubes). Top with crumbled bacon, cheese and green onion. The next recipe is my new favorite treat. It's not really a pancake, so I don't know why it's called that. I've been making it for dessert almost every night and it is so easy. It only takes a minute to prepare and I just stick it in the oven while we eat dinner. Heat oven to 400 degrees. Melt butter in a 9 inch pie plate in the oven. Brush melted butter up onto sides of pie plate. Sprinkle brown sugar and cinnamon over the bottom of the pan. Arrange sliced apple on top. Beat eggs slightly in a medium bowl with wire whisk or hand beater. Beat in flour, milk and salt until just mixed (do not overbeat). Pour into pie plate. Bake 25 to 30 minutes or until puffy and deep golden brown. Loosen sides and invert pan over plate. Sprinkle with lemon juice and powdered sugar. Serve immediately. I'll have to try that soup. I'm always looking for soup recipes. And the apple pancake looks good too! Yes you are amazing! those look so good, Im going to try them, the pancakes look delish!! Love new recipes. I am going to try them both. You make having a new baby look so easy. I agree you are amazing! Potato soup is my favorite!! I will have to have Ryan make your recipe. 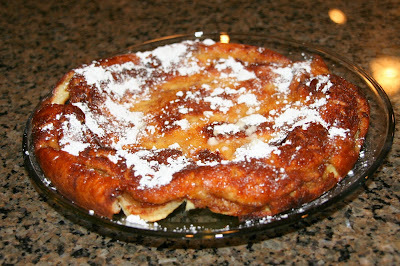 And the apple pancake looks sooo good! I think that is a recipe I can handle. I am defenitely going to give it a try!